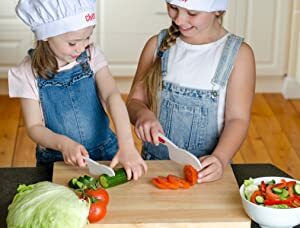 START KIDS OFF WITH A LOVE OF COOKING – Your new set of kids knives will be such a hit, they will soon be helping you create delicious dishes. You’ll even receive a FREE Bonus ‘101 Cooking Tips’ PDF to get you started! Little people just love helping out in the kitchen! 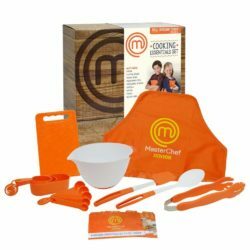 But often the worry of letting kids work with knives is just too much – until you try our real Kids Knife Set. 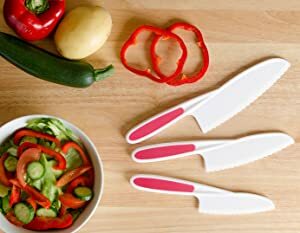 This set of 3 nylon knives feature serrated edges which actually cut most types of food, but won’t cut skin. 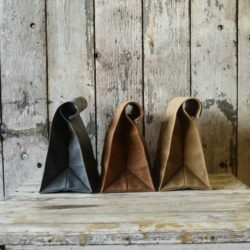 Finally you can stop hovering when the kids want to help with dinner! 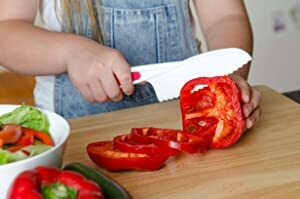 These knives have been designed with little hands in mind – there are 3 sizes to suit most ages (recommended for ages 4+ and always with adult supervision). 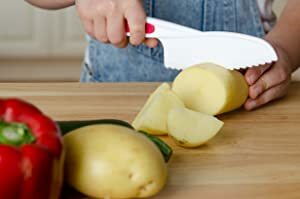 The tips are blunt yet the serrated edges cut food efficiently with a sawing action. 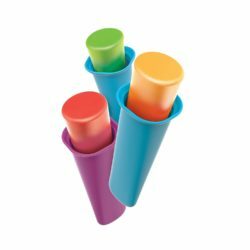 The soft rubber grip on the handle provides a good grip for small fingers. Kid-tested on tomatoes, cucumber, bell peppers, potatoes, carrots, zucchini, strawberries and more! 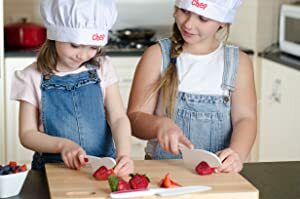 Cooking is such an important life skill – the earlier we get kids interested, the more they will learn and grow to love healthy food and cooking. These knives will help get them involved in making real meals! They make the perfect holiday and birthday gifts too! 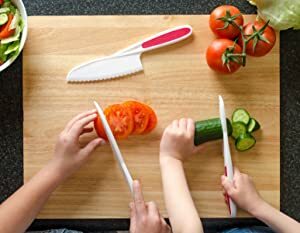 Our kids knife sets are made with high quality, food grade, BPA free materials. We want to feed you! P.S. FREE GIFT! 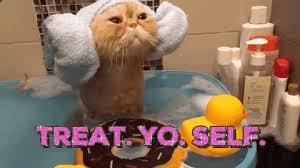 Subscribe and also receive "11 Quick Tips for Eating Anything AND Staying Healthy"